Rotisser is the most sophisticated cookware range for all around cooking. Lasting design meets the latest technology for induction. Rotisser combines highest quality materials, unique induction technology and award winning design bringing luxury to your everyday life. Suits cooking on the hob, in the oven and serving on the table. 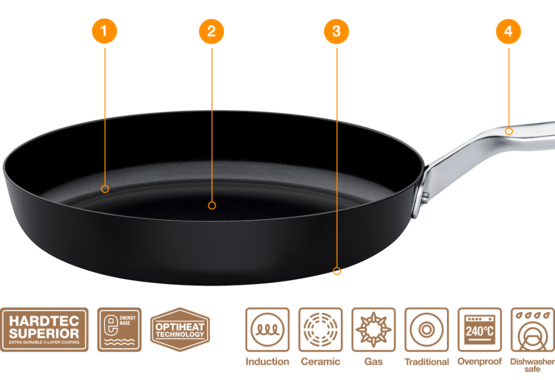 Rotisser with OptiHeat technology is the perfect pan for induction hobs. 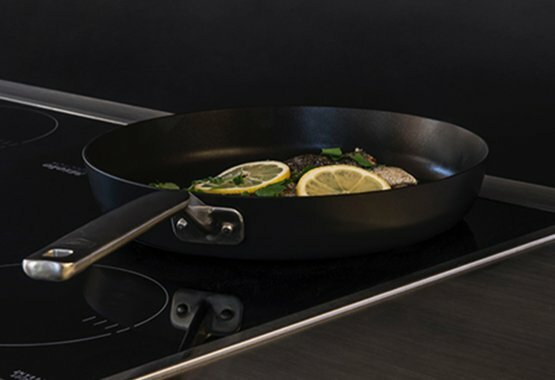 Rotisser frying pans have a unique and innovative Optiheat base technology that prevents the pan from overheating on induction hobs by ensuring that the temperature does not exceed 230 °C. The heat control prevents the pan's coating from being damaged, which prolongs its service life and provides perfect cooking results. Made of light aluminium that conducts heat extremely well which means that the sides of the pan heat the food too. The durable and non-stick Hardtec Superior coating makes cooking easy. The energy base is optimised for 50% faster heating and saves 30% energy. Stainless steel is safe and stays cool. OPTIHEAT technology optimised for induction. All Rotisser cookware are made in Sorsakoski factories in central Finland.